Each morning, not very long after I finish posting, I head out to my (still relatively new nonacademic) job at The City University of New York (CUNY). And as you may have noticed from time to time in my posts over the past few months, I’ve been getting to know a lot about the different parts of the University–including the truly amazing collection of writing programs that fall under the CUNY umbrella. Now we can all get to know these writing programs even better, through the writers on their faculties. 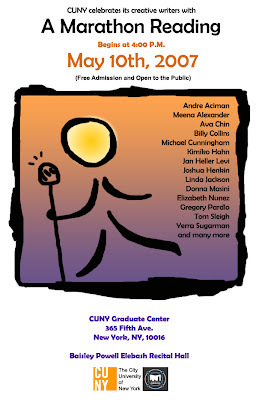 Many of these writers–including Michael Cunningham, Billy Collins, Tom Sleigh, and many more–will be taking part in a “Marathon Reading” at CUNY’s Graduate Center. The event is slated for Thursday, May 10, beginning at 4PM. Check out details here.